A cosmetics shop has ended a year-long dispute with a council by repainting its "garish" yellow frontage. Newcastle City Council had deemed L'Occitane's front on Grainger Street "unacceptable" and "harmful" when it was painted in March. A planning inspector then agreed with council planners saying it was "garish and obtrusive" to a listed building. 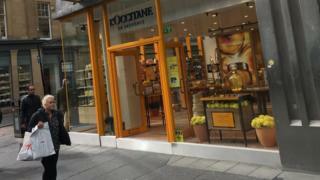 L'Occitane has now changed its frontage to an off-white colour, saying the street's heritage is "crucial". The shop, formerly occupied by Vodafone, is a listed building dating back to the 1830s but was refitted without planning permission from Newcastle City Council. The company appealed against the council's demand to change the frontage but planning inspector Philip Lewis sided with the authority, according to the Local Democracy Reporting Service. He said: "I accept that this is a commercial part of the city but its historic importance, reflected in its conservation area designation, requires a careful approach to shopfronts, particularly where listed buildings are also involved." In a new planning application for the off-white, L'Occitane said: "Conserving the aesthetic and history of Grainger Street were considered as crucial."